The 3D comic style with an active camera provides a dynamic and varied gaming experience for both younger and older players. On the planet Gelly live the gallart-like Gellies. Their existence is threatened by the evil Evil Blob. The players in the form of two Gellies, created in a laboratory, begin their adventure to save the planet, culminating in a final battle with Evil Blob. 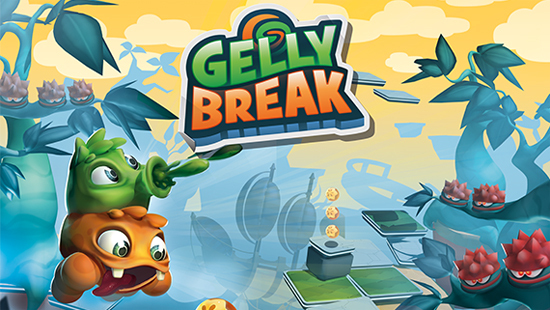 GELLY BREAK is easy to pick up and offers diverse levels. Thanks to the possibility of changing the difficulty after each level, the game stays challenging for every type of target group. The player use all of their abilities to defeat many different enemies. The ever more challenging Jump & Run passages overcome the players only, by using the Switch-mechanic of both Gellies and coordinated timing. The gameplay stays diversified by mixing boss fights and shooter parts. The Nintendo SWITCH hardware comes as standard with everything you need to play a co-op game, making it the ideal platform for Gelly Break. Gelly Break resembles a board game. It wants to bring parents and children as well as friends closer together again, to play together again and not alone in front of a screen. Unlike other games, no additional hardware is needed. In addition, the Nintendo SWITCH as a handheld it is always and everywhere ready to use. After only a few minutes, the catchy control provides for entertaining but always recurring fun game sessions, which can also challenge experienced players due to the adjustable difficulty level. The motto of Gelly Break is quite clear: "Stay together, play together!"